With close to 100,000 voters now registered for the 2014 Fiji election and discussions on a new constitution well underway, the Bainimarama Government is making good on its pledge to return the country to democracy with concrete action across a broad front. There’s now ample evidence of the regime’s commitment to hold a free and fair election to accepted international standards on a level playing field of one man, one vote. Yet it continues to attract an array of negative perceptions that are undermining its credibility and damaging its message – both in Fiji and abroad. Chief among these is an image of repression arising from the current tight legal constraints on political gatherings of any kind. Some of this – Grubsheet believes – is unnecessary and counterproductive. Why? Because it stands to reason that holding a free and fair election requires political debate and the ability to meet and organise. Just as freedom of religious expression requires the ability to meet and worship. Simply put, you can’t have one without the other. And to pretend otherwise is a fiction that doesn’t make for good reading for people who otherwise want to support the process. That said, some controls are clearly necessary. In fact, they are essential to ensure national stability and protect the economy on which the livelihood of every Fijian depends. Even its critics will concede that there is fevered opposition to the regime in some quarters and especially from those it removed at gunpoint in 2006. Commodore Bainimarama has already spoken of an alleged attempt to organise a coup against him by the renegade officer, Ratu Tevita Uluilakeba Mara. And while this was thwarted, traumatic memories linger of the concerted effort to kill the Prime Minister during the mutiny of 2000. Unfortunately, the assumption must always be that those who failed in that attempt would – if given the opportunity – try again. There has also been a discernible escalation in the fury of the government’s critics on internet websites, especially since the corruption trial began of Laisenia Qarase, the deposed prime minister. These people do not want a successful election in 2014 and will do everything they can to derail it. They want Qarase restored and the continuation of the old order that favoured the i’Taukei, not the Bainimarama revolution of a multiracial, merit-based Fiji with equal rights for all citizens. Suffice it to say, few in positions of authority in Fiji doubt the need for the utmost security and vigilance as the countdown to 2014 enters one of its most crucial phases. Yet these security concerns need to be weighed against the right of citizens to congregate to discuss the country’s political future and their participation in it. And this is where Grubsheet believes that the regime should loosen the reins. The Fiji Police Force is adamant that if politicians want to discuss politics and the constitutional process, then they need to apply for a permit. Yet surely it’s a question of how many people gather in the one venue and how much of a potential threat that poses to public order. This week, we’ve had the police Director of Operations, Rusiate Tudravu, reiterate that any gathering of three of more people to discuss politics is deemed to be a “meeting” for which a permit is required. He said that if any event is “social” or “festive”, then no permit is necessary. But police can still intervene “if they have reasonable information that any issue could undermine the safety and security of Fiji”. Grubsheet, for one, fails to see how any gathering of three people – no matter what they discuss, aside of course from a criminal conspiracy – has the potential to undermine the safety and security of the country. Let’s dissect the logic here. So two people can talk freely about strategy for the 2014 poll – and even the need to defeat the Bainimarama government at the ballot box – but add a third and you need to get a police permit? It just doesn’t make sense. And worse, it’s undermining the positive elements of the return to democracy and presenting an image of a government that’s oversensitive and boxing with shadows. When Fiji has such a good story to tell, it’s a paragraph in the narrative that needs to be deleted. No one is blaming the police. They’re just doing their job. But even they must wonder why they were sent to a house in Lautoka last week to arrest a clutch of aging Indo-Fijian Labour Party members who’d gathered at the house of party stalwart, Vyas Deo Sharma. The Labour leader, Mahendra Chaudhry, says the group was merely “having a yaqona (kava) session at a private residence when the police barged in”. The Government, in response, says they were discussing politics and had broken the law. But in Grubsheet’s view, whether they were discussing politics or “just drinking yaqona” is neither here nor there. They should have the right to do both and the decree that says otherwise should be amended. Aside from any question of the justice or otherwise of this incident, it’s simply not a good look, especially when those arrested weren’t released until the following day and no charges were laid. There needs to be a much more realistic limit set on political gatherings for which permits are required. Not three people but, say, 30-40 people – the size of an average classroom. Much more than that and we’re fully prepared to concede the potential consequences for public order and the need for police to be informed. In addition, any meeting should be confined to clearly defined venues – whether homes or community halls – with strict prohibitions on these turning into protest marches. 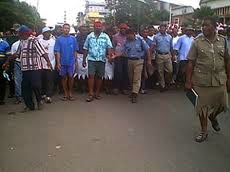 History tells us that any gathering that spills onto the street definitely has a history of getting out of hand in Fiji. Certainly no business owner who lived through the anarchy of 2000 wants even a hint of this ever being repeated. So public order must be maintained at the same time as the public needs a right to unimpeded discourse. It’s time for a better balance to be struck that gives more weight to the mood in the country to talk politics. The Christians among us know that in Matthew Chapter 18, Verse 30, Jesus Christ said: ” Where two or three are gathered in my name, there am I”. 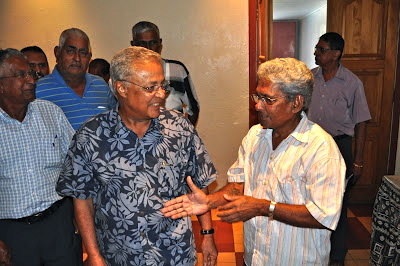 But in Fiji, where three or more are gathered to discuss politics, the State shouldn’t be there at all. It should leave them to get on with it without undue interference and the need for a piece of paper from the police. In Fiji, the head of every man, woman and child is Aiyaz Sayed Khaiyum and Frank Bainimarama, with the power of the guns. Graham’s road to Damascus or just a one-off slip of pro regime mask? Saul and Judas, it’s spelt kutu with one “l” and you have no idea how much pleasure it gives me to have caused such discomfort. Sorry to say there’s been no Damascene conversion that would lead me to change my basic stance. I call it as I see it, as I’ve always done. And when I see what I don’t like, I say so. Fiji Labour Party is own by Chaudhry Inc.
1. chaudhry nepotistically appoints in-law sachida senator on hefty govt salary/perks. 2. Beta rajen was appointed PM’s secretary. what we have is a case of mahen ‘the harami’ chaudhry’s chamcha and lackey, Deewana, suffering from a case of denial syndrome, or the three monkeys’ syndrome – see no evil, hear no evil, talk no evil of mahen. This confirms MPC is has turned FLP into a party of bandars and monkeys who hero worship him at every turn. FLP = Bandaro ka Party. but the puppy has it’s tail up and power to piss on every tree. I was one of those few who actually lived through the mutiny attempt in 2000 and i witnessed Frank and his men find their way to safety through the valley that separated about 10 homes and the Military barrack off Salato Rd in Namadi heights. The following gun battle that took place to free the QEB from the CRW soldiers is something i will never forget because as citizens of a usually peaceful nation one is never prepared for something like that. 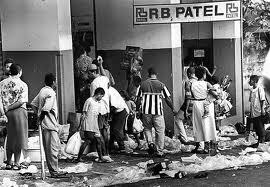 I was also unfortunate to get caught in Suva city at the time of the riots. Although i was not harmed it was an experience that could have gone very ugly and all that was needed was one racial spark and we could have had a Rwanda style massacre on our hands. Fortunately for us the looters and rioters were interested in the “sparkles and glow” of the duty free stores then anything else. Despite the few short comings of government one of which you have aptly described we must support Frank at all costs because if he succeeds his greatest legacy would be that Fiji would be free from coups once and for all. Their is a common practice amongst firefighters sometimes too put out fires they actually light a bigger one. I think the analogy applies to Fiji’s Coups very well. When will you all get into your heads that these 2000 events would not have happened if Frank and others had not conspired to overthrow the Chaudhry government. He was behind the coup, and now is covering his backside by pretending to be doing everything to make Indo-Fijians equal citizens in Fiji. There will be more Speight types in the future if we< Indo-Fijians, continue to swallow this man's propaganda. Aiyaz Sayed-Khaiyum always gives in to his vindictive streak. This time he is targeting the Citizens Constitutional Forum (CCF) and its founder, the reverend Akuila Yabaki. Khaiyum has managed to get leave granted by the High Court to issue contempt proceedings against both Yabaki and the CCF. The reason for Khaiyum’s move is because the April edition of the CCF’s newsletter, Tutaka, published an analysis by the Law Society of England and Wales which maintained that the rule of law had been “lost” in Fiji. Never mind the public’s right to free speech and its right to hear and read different views on contemporary topics, we are living in Khaiyum’s very own police state where he can manipulate the law to supress everything from criticism to statements of truth. In a move that unfortunately reminds us of the dangerously simplistic policies of one Adolph Hitler, the old whore of Horowhenua is suggesting his very own version of a Final Solution to help the Bainimarama dictatorship. While Hitler saw the extermination of the Jews (plus homosexuals and gypsies for good measure) as a means of ensuring the future of the Third Reich, Croz clearly believes that the political extermination of the likes of Chaudhry, Qarase and company by de-registering their respective political parties would be a good way forward for the Bainimarama regime. In other words, remove any political impediments that might prevent Bainimarama and his followers from sweeping into power at the forthcoming “election”. Come to think of it, if Croz thinks the regime needs to move the goal posts that far, why not simply cut to the chase and advocate the immediate establishment of a Baninimarama-led dictatorship-in-perpetuity? You are all a bunch of hybrids and corrupt mentality. Your words reveal more of your self centered ideas. Symbolically portrayed as a “Pit Toilet” that has no button to press. – in another sense does not even know what is right or wrong. Negative breed. 4.5 fits their description, neither male or female. “The Light”, you’re right. I don’t have to do anything or respond to anything. These people condemn themselves by the very nature of what they say and how they say it. Continue the good work. Soon you will have more to write and reveal. All this people who are full of negativity are all walking time bombs. They will self destruct at the appointed time. Your writings will trigger these bombs in them and one by one they are brought into the light of the truth and ready to detonate. They are hybrids and being wired by the master of deception – none other than Satan that old Devil. I see them as lost soul in the land of the dead. They are crying out to have a life, but the true ways of life they do not understand. For them life is death.